From today public bodies, including schools and hospitals, are no longer allowed to purchase single-use plastics such as cups, cutlery and straws, writes Joyce Feegan. The government-wide ban, which was announced in early January and comes into effect today, aims to reduce single-use plastics in our environment. A spokesman from the Department of Communications, Climate Action and Environment explained to the Irish Examiner, where exactly the public can expect to see this ban in effect. “Regarding the government-wide ban, all government departments are expected to have stopped purchasing plastic cups, cutlery and straws, from the date of the announcement (January 4). “All public bodies were given a bit more time, as outlined in the announcement but from this week, all public bodies, including schools, should no longer purchase the named single-use plastic items. ‘Public bodies’ includes hospitals, schools and government agencies,” the spokesman said. The public bodies are now banned from purchasing single-use plastic cups, cutlery and straws for use on their premises. The development follows a new EU directive on single-use plastics, which will ban straws, cotton bud sticks made from plastic, plastic plates and cutlery, plastic coffee stirrers and plastic balloon holders. Both the European and Irish moves follow the public documentation of plastics in marine life, from the digestive tracts of whales to the respiratory systems of turtles. There is also a growing body of evidence showing that plastics have entered the human food chain. Aside from killing wildlife and entering our food chain, the problem with plastics is that they are non-biodegrabale and will sit in the earth for 400 years. Furthermore, only 8% of plastic is being recycled globally. The spokesman from the Department of Communications, Climate Action and Environment also stated three other plastic-reducing initiatives the government has committed to. These include a commitment to a 90% plastic bottle collection target and a 55% plastic recycling target. The government has also commissioned a review to establish the best way to reach a 90% collection target for beverage containers. While there has been a huge increase in public awareness around the environment in recent months, tackling our plastic use is just one hurdle in tackling climate change. Irish universities, businesses and social entrepreneurs have also found innovative methods of plastic reduction. Two and a half million plastic water bottles are generated in Ireland every day, with people buying single-use bottles of water on-the-go, as opposed to carrying a refillable container. But Irish people were backed into a corner in a sense, explained Barry O’Connor, founder of Refill Ireland, because we have so few external public water fountains in Ireland, compared to the rest of Europe. 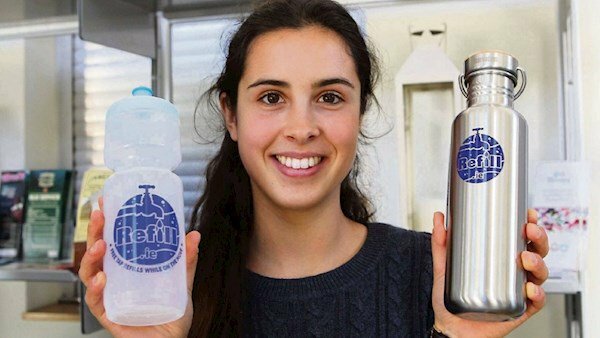 Barry, an environmental scientist, set about investigating why and set up Refill Ireland as a result — it has recruited 710 private businesses and public enterprises to allow people refill their water bottle on their premises. You can see where to fill up your water bottle on their ‘tap map’ on refill.ie. An app is in development. “We set up in early 2017 as a not-for-profit social enterprise. “We wanted to understand why there was a lack of external public drinking water points in Ireland. “There are a lot in Europe, where countries maintained their external water points,” said Barry. “We used to have thousands of water hydrants in Ireland and they were taken out after demand for them dropped when piped water became readily available in the 1950s and so on. The hydrants were neglected and vandalised. "They were made from cast iron so they needed a lot of repair work. Local authorities let the iron corrode and the pump mechanism got rusty,” added Barry. He said people in Ireland were then “forced into a corner where there are very few public water points” and they are “too embarrassed to go in and ask to fill up a bottle for free in a coffee shop or pub”. Barry heard about the Refill project in Bristol, where 200 businesses had signed up to allow the public fill up their water bottles there for free. “When I saw it I thought, why can’t we do that here? "I am an environmental scientist. Two and a half million plastic bottles are generated in Ireland every day." “Refill Ireland is a waste prevention project. When waste is prevented, there is no waste management problem later on,” said Barry. “We want to eradicate the need for single use plastics bottles, someone can still have a choice and buy one and we’ve no problem with that, but we want to provide an alternative to having to always use a single-use plastic bottle,” he added. While working full-time as an environmental scientist, Barry worked is as a volunteer alongside four other volunteers and one part-time staff member, whose salary of which is covered by the Regional Waste Authority. Barry explained how they developed the ‘tap map’ and how the public can refill their water bottles when out and about in Ireland. "The ‘Tap Map’ is a network of locations around Ireland where the public can refill for free. They can refill in private business or public locations, getting filtered or unfiltered water and it can be self-serve or staff can serve." "There are butchers, bike shops, bookshops, B&Bs, doctors’ surgeries and receptions in office blocks that have signed up. “It’s been good for businesses, it helps them promote a positive welcoming image and a business that is promoting waste prevention. “We have 710 water-filling points, and 550 of those are in private businesses. The rest are on-street points or in airports. “We recruit businesses by asking local Tidy Towns groups or other community groups to ask businesses in their area. We also approach people directly and businesses also come to us,” he said. “You will know by checking our Tap Map on refill.ie or by a shop having a sticker on its window. Not all businesses have stickers as they might be a professional office that has a no-sticker policy,” he added. Refill Ireland has several other strings to its environmental bow. “We also do sporting events so we were at a 5k run with 1,000 people and provided tanks of filtered water at the event and saved 6,000 plastic bottles entering the waste chain. The organisers were able to say they have a zero-waste event,” Barry said. “We are also in talks with Cork County Council to provide filtered water tanks at the final stages of the city marathon, in addition to water being provided in plastic bottles. It’s all moving in small steps in the right direction,” he added. 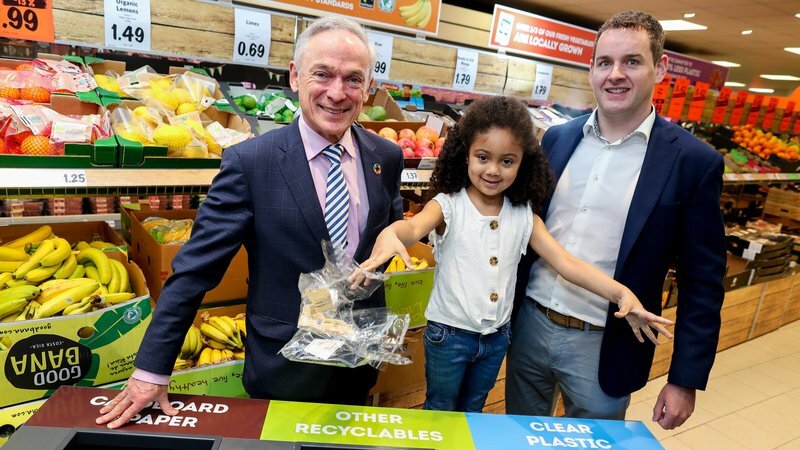 Cork-based and family-run business, Down2Earth Materials supply a wide range of compostable food packaging to more than 2,000 Irish delis and cafes. Their sales have doubled year-on-year for the last three years, from €2m in 2017, to €4m in 2018 and they expect to see sales pass €6m in 2019. Director Chris Murphy, told the Irish Examiner about the boom their business has seen in the last two years. “Down2Earth Materials started in 2009, so we are celebrating 10 years in business this year. "It was a challenge to engage with people in 2009 with regards compostable packaging, but in the last two years we’ve seen significant interest,” Chris said. Compostable cups have been a popular item of theirs. "Take-away coffee cups are traditionally lined with plastic. We supply cups made from plant-based linings and use vegetable-based inks." “We have over 2,000 customers throughout Ireland from local delis and cafes to well-known brands such as Bewleys, Java Republic and Frank & Honest,” said Chris. “One in four cups in the Irish market is now compostable. We proudly supply over 60% of those,” he added. Another popular item Down2Earth Materials supply is compostable food boxes for take-aways. “Take a chipper, if you get curry chips in a polystyrene container, the food sweats in this synthetic container and it’s soggy to eat. "The alternative we have is made from bagasse, made from the leftover waste material from the sugar cane industry, it keeps food warm and crisp and it’s compostable too. “With barely a few cent in the difference between the two types of containers, bagasse is great for your food and the environment,” he explained. Chris has seen firsthand how the market is evolving when it comes to plant-based food packaging, with customers asking their local coffee shops, delis and supermarkets for sustainable packing. While sustainable alternatives have never been associated with being low-cost or profitable, the experience of Down2Earth Materials proves otherwise. “In terms of price our products aren’t expensive, you’re talking a couple of cent in the difference between a plastic-lined container and a compostable one. “This year we’re on target to have €6m in sales, that is €2m growth each year since 2017. Job growth wise, we’ve gone from seven employees in 2017 to 14 in 2019,” explained Chris. He believes the education sector and the work of broadcaster David Attenborough have both helped to shift people’s thinking. "I’ve been in the industry for the last decade. I’ve seen the demand for compostable and recyclable products start in the education sector, move to the business sector and now it’s penetrated the masses and the demand has gone mainstream." "Change has been coming for a long time. Consumers are actively seeking brands that use environmentally-friendly packaging,” said Chris. However, it is the change in the last two years that has been the most rapid. “In the early years, we knew change was coming and required but we thought people would adapt faster. In the last two years we have seen interest beyond our expectations. I would definitely say Blue Planet and David Attenborough and the viral turtle video were turning points which started people to question traditional packaging,” said Chris. UCC is home to Ireland’s first plastic-free cafe. Not just metal knives and forks, but behind the scenes too, from how food is delivered and stored. The Bio Cafe in the BioSciences Institute opened in September 2018, and has attracted interest from all over Ireland and abroad as to how it achieved its plastic-free status. It’s not just a plastic-free cafe that UCC can boast, the university is aiming to remove single-use plastics from its campus completely and it has been working towards this for some time. UCC’s Sustainability Office, Maria Kirrane, told the Irish Examiner how the cafe came about. "Our plastic free movement in UCC started in September 2017. We ran a campaign in the library as we noticed there were a lot of single-use cups in the bin and contaminated waste." “We wanted to tackle that culture of using something once and throwing it out. We did two things, we banned the library building and KSG, who have the catering contract on campus and offered a 15c discount for people who brought reusable cups for their coffee. Sustainability is part of their contract and they sit on our green forum,” said Maria. “That was in September 2017 and then in September 2018, the students’ union gave reusable cups to every incoming student,” she added. It was from here that the Bio Cafe came about. “Then we started thinking how can we bring this further. We decided to take one site, one cafe and make it single-use plastic free. We did this in the Bio Cafe in the Biosciences Institute. They were going to be upgrading that cafe anyway. That launched in September 2018 and both front of and back of the house is plastic free. “We had to go through the entire supply chain and change where products were sourced and we got more local suppliers so the bread comes in in brown paper now,” said Maria. In terms of how it functions, the sustainability officer said it simply runs in the “old school” way. “The cutlery and condiments, everything is old school. The mayonnaise is in a jar, the salt and pepper are in shakers. It’s gone back to the way things use to be. “You can refill your water there. You can bring in your own takeaway container for food or sit in and you can get your coffee in your reusable cup. "It’s soups and sandwiches, so you can get your lunch there,” said Maria. Outside interest focused mainly on how they achieved a day-to-day functioning that didn’t rely on plastics, as well as how this worked with suppliers.The success of the cafe has now spurred UCC to further up its green game. “We are looking at what worked there and aiming to roll it out everywhere on the campus. Our goal, taking into consideration we are a research institution with labs, is to be a single-use plastic free campus,” said Maria. UCC has been working towards these projects for several years, having had a green campus committee and green forum in situ for a long period of time. Fast-fashion is another major contributor to plastics and waste in our environment, with polyester being non-biodegrabale and our throw-away culture when it comes to cheap clothing. Cork woman Emylou Hurley, is the CEO of Organic Movement, which sources and imports organic cotton and ethically made yoga wear. Having spent 10 years working in retail, and knowing the supply chain inside out, Emylou went travelling to India for three months. Seeing life in India and with her professional background as a buyer, she was perfectly poised to start a business in sustainable clothing, and for an eager community of people who care about the environment. "Last year after travelling to India for three months, I watched for the first time a film called True Cost. I became a conscious consumer overnight." "I had always been aware of the supply chain, having worked in retail for over 10 years, and as a buyer for three. But my time in India, opened me up to a whole other world of consumerism and showed me the importance of ethical sourcing,” said Emylou. “Having practised a lot of yoga in India I wanted to buy more sustainable yoga wear made from natural materials. I didn’t want to wear anything synthetic. After a few failed attempts, an opportunity presented itself in August 2018. I found a supplier of yoga wear with a collection made from organic cotton. The range included leggings, sports bras and tank tops,” she added. Emylou started selling the products at pop-up events in order to test the market and find her customer base. The response was immediate and positive. “To test the market, I sold the collection at the Ballymaloe Craft Fair in October 2018, and again at the Dublin Flea Christmas market in December 2018. There was a great reaction. “Customers not only liked the high waisted leggings and the comfort of the organic cotton, they were passionate about supporting a brand that sourced ethically,” explained Emylou. While working for herself had been a motivating factor, doing work that contributed to sustainability was also a driving force. “My ethos is ‘ethical, sustainable and organic’. I avoid using synthetic garments as they are a huge contributor of micro plastic pollution in the oceans. Polyester is not only non-biodegradable, it takes a lot of energy to produce (70 billion barrels of oil are used each year),” said Emylou. “Cotton can have its own disadvantages, as a lot of water is required when farming the crop. But with organic cotton, less water is consumed and no pesticides are used. This prevents water contamination, creates a safer environment for farmers and conserves biodiversity. It is also a biodegradable, natural, soft and breathable fabric,” she added. Business wise, Emylou is in the process of setting up on online shop and has plans to get OM stocked in yoga studios and shops across Ireland. She is currently on the entrepreneurial and business management programme ran by Springboard. She will also be taking part in the Fashion Revolution Week 2019, at D-Light Studios, in Dublin on April 27, as well as at the Mind Body Experience festival in the RDS in May. Like the other businesses, the environment is what motivated her to create her clothing brand. What motivates me is trying to create awareness of the environment, and what impact we are having on it. "Plastics are so harmful for the environment but the ethics and supply chain of the garment industry are also hugely important to me,” she said. “The awareness around sustainability is just growing and growing. Consumers are becoming more conscious and want to take action on how we can protect our planet and oceans,” she added. While takeaway coffee cups, with their plastic lining, and throwaway water bottles have come under the bright environmental spotlight in recent times, another daily item coming under scrutiny is the humble toothbrush. With people going through between six and 12 toothbrushes a year, and with the handle and brush made from plastic, bamboo has emerged as an alternative material for the product. One man making them is Dylan Regan, CEO of VirtueBrush. “Our main product is a bamboo-handle toothbrush,” he said. "The idea emerged in 2015, we wanted to create a plastic-free toothbrush. But we settled on a bamboo handle and nylon bristles for the brush, which is dental grade. We’re the only Irish brand doing this"
The VirtueBrush is sold in Ireland through health food stores, but the entrepreneur hopes that his business will have a more mass market effect. “These little items as insignificant as they might seem, are of major significance. It creates a market and the greenest one wins, it spurs this virtuous circle and a race to the top,” said Dylan. “These products are positive disruptors. They’re making big companies wake up and smell the coffee.” His own market has grown considerably since the business launched and like similar entrepreneurs, Dylan cites David Attenborough’s work for helping to shift public consciousness. “The David Attenborough episode on plastics on Blue Planet was a watershed moment for people. "A lot of people who would have dismissed that plastics is a problem saw that it was killing marine life, and everyone trusts David Attenborough,” he said. Another tenet to his business is a charitable donation. "We are partnered with Trees of the Future, so a tree is planted for every brush sold. Forest gardens are grown and it lifts families out of poverty." "It also cancels out our carbon emissions,” explained Dylan. While he is an entrepreneur, the environment is his driving force.“The plastics industry plans to increase its supply five-fold over the next 10 years. It has to become a movement of people across society not using plastic. Collective action can have a positive impact,” he said. Rash’r, another Cork-based business, hit international headlines in March, for its colourful rash vests made from recycled ocean plastic. Its CEO Tom Cotter told the Irish Examiner that sustainability became a key issue for the sportswear brand when starting out. Sourcing eco-friendly materials for stretchy clothing put 18 months on their open-for-business date, but having grown up around nature, Rash’r’s co-founders were adamant that they wanted to do things right. “We started three years ago — myself, and Alex Musgrave and John Downey are the co-founders. We had all grown up around the water, either surfing, sailing, or scuba diving. "Rash vests were the one garment we had in common, but you could only get them in blue, black or red. Like most watersports people, we were naturally eco-conscious,” said Tom. "We started going to trade shows and there was a massive focus on sustainability. We had no idea how bad the fashion industry was in terms of its plastics use and waste." "The challenge at this one trade show was to make your business as sustainable as possible. This put 18 months on our business getting started,” he added. The entrepreneurs had already settled on a fabric that was not sustainable, but stepped back and reconfigured in order to find one that was. “We couldn’t find any eco-friendly fabrics at first. Then we met one guy who was in testing mode with a sustainable fabric and we stayed in touch with him,” said Tom. Explaining the fabric they finally settled on, Rash’r CEO details how its made. “For the rash vest, we use fabric made from recycled ocean waste. The company that we get our fabric from go around the Mediterranean and they have contacts with the marine fishing industry. "They collect damaged nets and plastics that have been dumped at sea and they also collect post-consumer goods that would otherwise go to landfill." "That is all shredded and turned into pellets and that goes to a mill where it’s spun into yarn and made into fabrics of different weights,” said Tom. The vests still require Spandex, but the firm is now looking for a sustainable alternative to that. When they hit international media headlines for their innovative use of recycled ocean plastic, the colour and prints on their rash vests also drew attention. “We had various graphic designers working on our prints and we found a multimedia student (Dave Marshall) who was looking for work and we asked him to try his hand at the designs, and he designed our first graphic. “There’s just nothing else like it on the market, when you’re on the water it’s about having fun and not taking yourself too seriously. When we did our market research, we found people loved colour. You can be fun while being eco-friendly,” said Tom. The brand sells all across the world from Ireland to the UK and from the US to Australia. But sales and fun aside, the entrepreneurs are serious about the environment. “This can’t be a trend for six months. We’re not even getting to the top of the iceberg now. In 10 years there will be no coral reef left, we may be able to reverse it, but we need to take severe action,” said Tom. “We had no idea how bad the fast fashion industry was. What we’re aiming for is biodegradable products and we are waiting on the technology,” he added.